Complete your space with this skillfully designed !nspire bench. A solid wood finish in red is sure to add contemporary flavour to any room. Your home will benefit from the unique and well-constructed red frame. Recommended weight capacity is 250 lbs. This double-bench makes the perfect seat for two with its homey charm and handcrafted design. Crafted to be sturdy, this solid wood piece may slightly warp and crack over time, magnifying its original style and organic beauty. The perfect furnishing to complement your rustic themed dicor, or to bring a natural flavour to your modern space. Its also right at home out on the patio, veranda, or garden the perfect place to sit and watch the sunset while nestled with your favourite book and a cup of coffee. The natural finish and easy design means this bench will quickly become an integral facet of your home. This lovely double bench literally puts you on a pedestal with its pedestal style design and construction. Crafted in a rustic modern style with a solid and sturdy base, this piece is one that will withstand daily use without showing wear and tear. The true beauty of this furnishing is emphasized by its consciously sourced materials, eco-friendly composition, and natural fine grain prominently put on display. Enjoy the spotlight while seated on this double bench thats just waiting to be the highlight of your home. 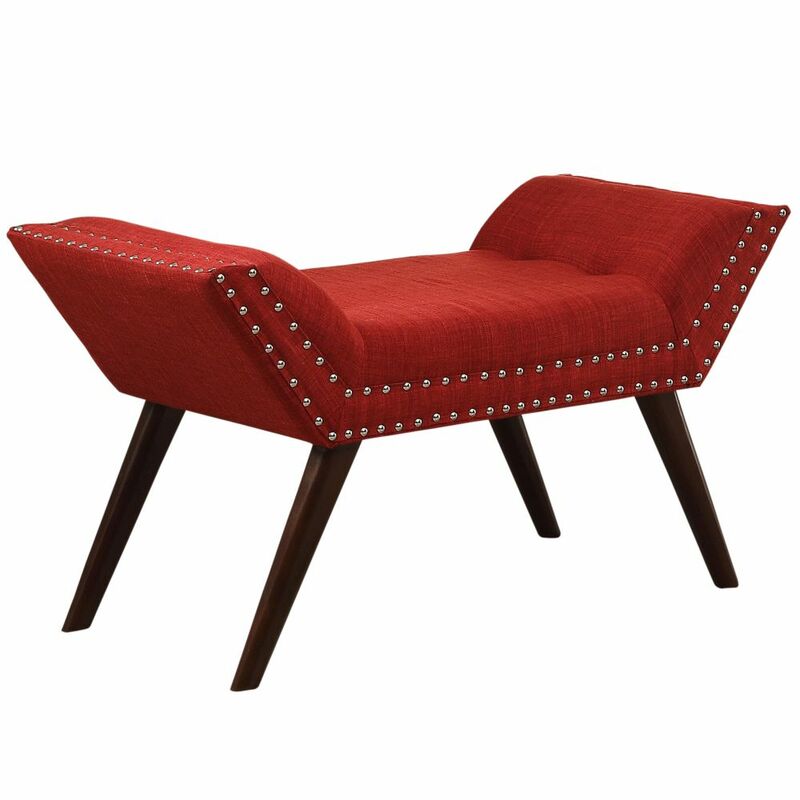 Pair perfectly with a coordinating dining table or place in an entryway or hallway for an immediate style injection. Lana 35-inch x 18.25-inch x 17-inch Solid Wood Frame Bench in Red Complete your space with this skillfully designed !nspire bench. A solid wood finish in red is sure to add contemporary flavour to any room. Your home will benefit from the unique and well-constructed red frame.